In truth, before the campaign proper had even begun, this scenario had all but evaporated. The prognostications of SA Best’s success were always based on one fundamental assumption: that the party had enough residual appeal to run second on primaries in a significant bloc of seats, and would surf into first place on preferences. Thus, Labor’s unprecedented decision to split its preferences 50/50 between the Liberals and SA Best effectively locked Xenophon out of the state election. While we’re yet see to the specifics of the strategy, Labor declared they would run a split ticket in Hartley, where the SA Best leader himself is running, and preference the Libs ahead of his party in 23 of the remaining 46 seats. Remember, of course, that Xenophon is only running 36 candidates in total. So, in other words, based on Labor’s original stated intent, SA Best wouldn’t get Labor preferences in around two thirds of the seats it’s contesting. Today, however, state secretary Reggie Martin clarified that because Xenophon was only running candidates in 36 seats, rather than all 47, Labor would in fact only preference against SA Best in half the seats it’s contesting – rather than half the seats in total. But that’s still 17 or 18 seats in which SA Best can’t rely on Labor preferences. The question is: do Labor and the Libs do a trade-off deal to safeguard their respective heartland seats from the Xenophon threat, with half an eye on the election in 2022, and the one after that? History suggests that once an independent or third-party interloper gets a foothold in a disaffected electorate, they can be hard to shift. And while both Labor and Liberal parties are desperately trying to win government on March 17, neither side wants to be dealing with a gaggle of entrenched SA Best refugees in the longer term. A preference ‘lock-out’, which has had vocal support from advocates on both sides, would effectively negate the entire premise of this campaign: that Xenophon can rely on preference flows to translate his protest vote into a genuine power play. But the last week and a bit has thrown up an even bigger impediment to his quest. December’s Newspoll was followed in late January by a leaked YouGov Galaxy poll commissioned by Xenophon-friendly entrepreneur Andrew ‘Twiggy’ Forrest’s Minderoo Foundation, which showed SA Best on the way to solid wins in both Hartley and Mawson, as well as being a mile ahead in Mayo. But a succession of subsequent polls, including an Australian Forest Products Association-backed Reachtel poll in the state’s south-east and most recently a series of Advertiser-Galaxy snapshots in key seats, suggests the gloss is well and truly coming off Xenophon’s campaign. Of biggest concern to Xenophon will be yesterday’s poll in Isobel Redmond’s former seat of Heysen, which showed SA Best’s John Illingworth trailing Liberal hopeful Josh Teague 39-22 on primaries and 51-49 after a speculative preference throw. Sure, it’s lineball – but at the 2016 federal election, Sharkie actually won the primary vote in the booths that make up Heysen, 6309 votes to the Libs’ 5954. It was the only seat in the state in which a projection of the federal election results had Xenophon’s party actually finishing first on primaries, rather than second. Indeed, senior Liberals had already effectively written it off and were doing their best to wash their hands of the local campaign. 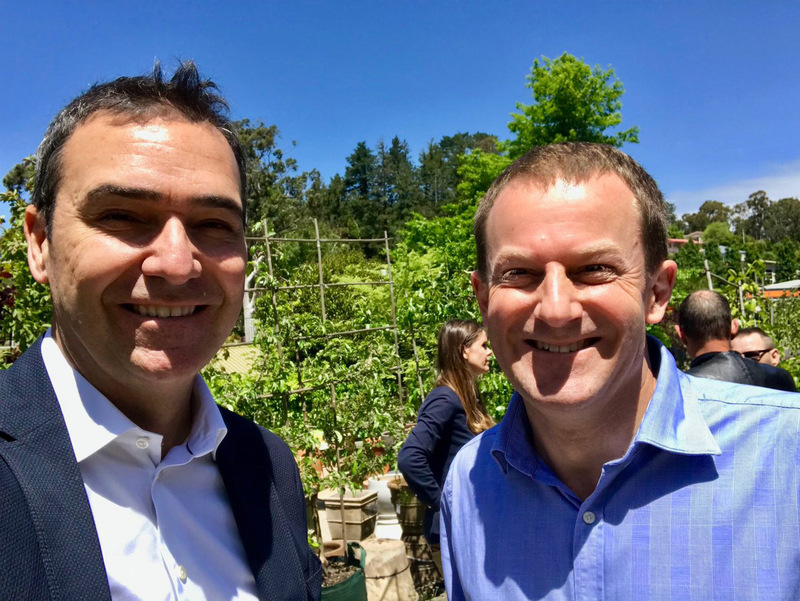 Steven Marshall with fellow moderate, Heysen candidate Josh Teague. But now it’s not only in play, it’s the Libs’ to lose. As the campaign wears on, a nagging suggestion appears to gain currency: that NXT’s success in the Hills region was artificially inflated by an unrelated backlash against the Liberals’ former Mayo MP, Jamie Briggs. And if so, the very premise upon which Xenophon embarked on this entire enterprise – that seats such as Heysen, Finniss, Morialta, Davenport and Kavel are all-but his for the taking – appears to have been vastly overstated. To be clear: if Xenophon cannot snare seats such as Heysen, it’s entirely possible he will snare no seats at all. More realistic at this point is his original prognostication: that he will jag somewhere between three and six seats – which could well still hand him the balance of power. But here’s the conundrum: parliament’s four incumbent independents – Frances Bedford in Florey, Duncan McFetridge in Morphett, Geoff Brock in Frome and Troy Bell in Mount Gambier – all have a fair shot at being re-elected. And while they appear unlikely to become a united front (Bedford and Bell appear the outliers: I can’t see Bedford backing a Liberal government any more than I can envisage Bell supporting Labor) it’s fair to assume that three of them could reach consensus, one way or another. So if either Labor or the Libs can snag 21 seats, it could be the genuine independents – and not SA Best – who decide SA’s next government. And that would leave Xenophon’s ambitious enterprise effectively in ruins – an impotent rump of disaffected MPs warming the crossbenches with four years to ponder their distant dreams of grandeur. Indeed, it now appears entirely plausible the Libs won’t even bother preferencing against SA Best at all, with insiders increasingly confident the Xenophon vote is in freefall. “The trend lines aren’t there at all for him at the moment,” one senior source tells InDaily. The shift against Nick is evident in his frequent media appearances: in years gone by, he’d be a fixture on the nightly news with a ready quip at the major parties’ expense. In fact, he’d regularly fluff his lines in front of the cameras as he sought to deliver the perfect zinger, although the outtakes rarely made it to air. These days, though, it’s the fluffed lines that make the broadcast, while the ready quips fall by the wayside. SA Best’s polling has hardly collapsed – he still appears to be competitive in a number of seats. But that will be little comfort if he fails to snag any of them. There is an emerging consensus that Xenophon has over-reached. That seduced by the soaring Newspoll and a swarm of eager candidates, he took on a task Herculean in its scope. Of course, in the mythic tradition, Hercules was driven mad by his labours. Had Xenophon targeted around a dozen winnable seats, and installed the cream of his candidates in them well ahead of the campaign, he could have consistently articulated a suite of detailed proposals for parliamentary and bureaucratic reform that would have enhanced both the practice of government in SA and his own standing in the polls. Instead, he is trying to hold together a statewide campaign while being bullied into releasing detailed macro policy prescriptions, most of which are then demolished by the major parties. And why? Because he’s running in 36 seats and doing well in the polls? Hell, the Greens are running in all 47 seats, and I don’t hear anyone demanding they articulate a policy on tax reform. Perhaps the rot that has now set in was first evident from the outset, when Xenophon announced Simon Jones as his candidate in Morphett – despite previously suggesting he’d endorse McFetridge as an independent alternative. When asked why he’d bother running in a seat that already had a candidate he’d support, Xenophon explained that Jones lived in the seat and was keen to run there. That’s right: a state seat campaign being dictated by the whim of an unknown cleanskin candidate. Xenophon’s reluctance to engage in preference deals also appears doomed to cost him, as it did at the federal poll. His thinking appears to be that he will be tarnished by the appearance of doing deals with the despised major parties. But in truth, the politics of preferences is so convoluted, it would hardly have measured on most voters’ radar in the final wash-up. In 2016, it probably cost him Barker and Grey. Who knows what it could cost him on March 17. But there is a precedent that springs to mind. At the 2014 Adelaide Lord Mayoral election, incumbent Stephen Yarwood – another with something of a Messianic political bent – made a point of not indulging in preference deals. In the final count, he went from finishing several hundred votes ahead to losing by 218 after the distribution of preferences. If it ends the same way for Xenophon, those wide-eyed hopefuls who threw their $20,000 lot in with him may well leap to the conclusion that he is not, after all, the Messiah, but a very naughty boy. Is there a way to get it all back on track? But it would involve a radical change of tack. The strategy of trying to take on the big boys at their own game appears to be backfiring spectacularly: not only is it not cutting through, it’s repeatedly exposing the SA Best campaign as underfunded, half-baked and chaotic. It needs focus and discipline: a consistent message that the party is not here to govern, but to hold the government to account. If there is remaining dosh in the party’s stretched coffers, it should be poured into a campaign imploring voters that if they can’t give Xenophon their first preference, they should at least give him their second – a message that should yet find resonance in a jaded electorate evidently seeking to send Labor a message but as yet unconvinced by the Liberal alternative. But, with the campaign well in train, Xenophon’s momentum appears to have stalled. If his polling numbers recover, the major parties have the means to lock him out. If they don’t, he’ll be lucky to outnumber the independents in a hung parliament. Perhaps the lesson we’ll learn from this most unusual of elections is the very notion that Xenophon set out to debunk: you can’t beat the system after all.